There’s no doubt that Sherry Lansing has had a stellar and storied career in the film industry. She was the first female president of 20th Century Fox and later went on to become chairman of Paramount Pictures. She’s also been a very successful independent producer. 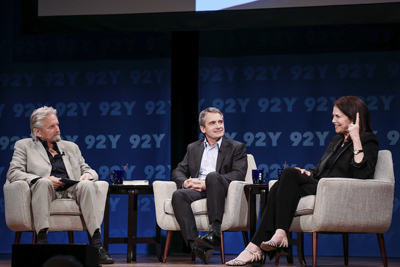 Ms. Lansing recently met up with old friend and colleague Michael Douglas and author Stephen Galloway at the 92nd Street Y to discuss her biography, written by Mr. Galloway, titled “Leading Lady: Sherry Lansing And The Making of a Hollywood Groundbreaker.” Mr. Douglas took the role of moderator and was clearly comfortable asking questions surrounding the book and reminiscing about his long standing professional relationship with Ms. Lansing. Despite getting two movie roles in 1970, (one in a John Wayne film) Ms. Lansing said that she felt that she “couldn’t act.” She instead wanted to learn the business from the ground up. She wound up landing a job as a reader at MGM in 1976. Impressively, she then became senior vice president of production at Columbia Pictures in 1979, where she first met Mr. Douglas while he was working on “The China Syndrome,” as well as overseeing the highly regarded and successful Kramer Vs. Kramer that year. She co produced that picture with Stanley Jaffe. Mr. Douglas recalled his first impressions of Ms. Lansing, saying that she was ‘“beautiful” and he spoke about the sexism that was prevalent at the time. Ms. Lansing stated she was “in denial” about it, including the remarks and passes made at her by men in the business, but for her the worst thing was her not being taken seriously in meetings with male executives. Ms. Lansing went on to climb the industry ladder, and in 1980 at the age of 35 was installed as the first female president of 20th Century Fox. In 1992, she was offered the major role of chairmanship of Paramount Pictures’ Motion Picture Group, but she noted that she hesitated before accepting the job, as her first love was producing. She had become quite successful in this as a partner to Stanley Jaffe in the Jaffe/Lansing Productions, which produced not only Kramer Vs. Kramer but Fatal Attraction in 1987, among other hits. Stephen Gallagher worked with Ms. Lansing for four years to get her story written. Ms. Lansing said she initially agreed to the book in a “total moment of weakness” over lunch between them. Ms. Lansing conceded that there are many things she doesn’t like in the book, but said “unfortunately they’re all true.” When Mr. Douglas asked Mr. Galloway what the biggest surprises were concerning working with Ms. Lansing on the book he stated that she has great humanity and empathy. He cited Ms. Lansing having worked on emotionally sensitive films like Forrest Gump as an example of this. Mr. Douglas discussed how he came into his role in Fatal Attraction and how Ms. Lansing supported him when the film’s initial director, Brian De Palma, refused to work with him. Ms. Lansing told De Palma “We’re sticking with Michael” and De Palma was replaced by Adrian Lyne. The film went on to gross $320.1 million with a budget of $14 million, being the second highest grossing movie that year after Three Men And A Baby. Ms. Lansing’s biography promises to be an engaging story about how a young girl grew up to be one of the most powerful people in Hollywood and THE most powerful woman in it, but it also has revealing behind-the- scenes stories about what went on during the making of some of the biggest movies in Ms. Lansing’s colorful career. As a movie buff and someone that’s interested in the inner workings of show business in general, I look forward to reading it.